Editor’s note: Determining the exact death toll following disasters is often difficult—if not impossible—especially in the case of disasters that took place long ago. The authors and the editors in this series have used their best judgment in determining which figures to include. ON NOVEMBER 12, 2001, AMERICAN AIRLINES FLIGHT 587 WAS SET TO TAKE OFF FROM J OHN F. K ENNEDY I NTERNATIONAL A IRPORT IN N EW YORK CITY. THE PILOTS EXPECTED A BUMPY RIDE. A BIG BOEING 747, A JUMBO JET, HAD JUST TAKEN OFF IN FRONT OF THEM . O N TAKEOFF, BIG PLANES CHURN UP THE AIR . T HEIR WINGS CREATE WHIRLWINDS , ALMOST LIKE MINI TORNADOES . T HE ROUGH AIR IS CALLED WAKE TURBULENCE . I T CAN SHAKE UP PLANES LIKE A BOTTLE OF JUICE . B UT PILOT E D S TATES AND COPILOT S TEN M OLIN WERE NOT WORRIED . T HEY WERE TRAINED TO FLY SAFELY THROUGH WAKE TURBULENCE . Sixty-six seconds after takeoff, Flight 587 hit the choppy air. Ed States spoke to air traffic controllers through his radio. “Wake encounter,” he said. Then a strange rattling sound filled the cockpit. The pilots heard a bump and another rattle. Then the plane’s tail fin ripped off. Without a tail fin, an airplane can’t fly. It will spin around and fall from the sky. That’s what happened to Flight 587. It spun to the ground. It crashed into homes and buildings in Rockaway Beach, New York. a big ball of fire and smoke. People were running up the road and the kids were screaming. impact in Rockaway Beach, New York. 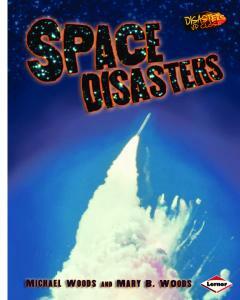 ALL DISASTERS , AIR DISASTERS ARE BIG , TRAGIC EVENTS . LARGE NUMBERS OF PEOPLE . TYPE OF AIRCRAFT, AND AN AIRPLANE CRASH IS THE MOST COMMON TYPE OF AIR DISASTER . BIG DISASTERS Most air disasters involve big passenger airplanes. Big planes can carry hundreds of people. For instance, a Boeing 747 can hold about 420 people. The Airbus A380 can carry more than 500 people. When a big plane crashes, the death toll can be huge.
} United Airlines Flight 175 flies toward the south tower of the World Trade Center on September 11, 2001. The hijacked plane crashed into the tower, causing the tower to collapse later in the day. HARD-TO-TELL DISASTERS Some disasters are easy to predict. For instance, scientists know that every year, dozens of hurricanes will form in the Atlantic Ocean. Some of these storms will hit land. They might damage buildings and hurt people. When people know a hurricane is coming, they can take steps to protect their homes. They can even leave town. But nobody knows when an air disaster is coming. Most air disasters are accidents. Accidents happen suddenly, without warning. AIRPLANE SAFETY Some people are afraid to fly in airplanes. They worry that their plane might crash. But the truth is that flying is one of the safest ways to travel. It is much safer than traveling by car. According to the National Safety Council, your chances of dying in an Air travel seems dangerous to airplane crash this year are many people. That’s because it’s about 1 in 441,000. unfamiliar. Most people don’t fly However, your chances of in airplanes every day, so the dying in a car crash this year occasional airplane trip can feel are 1 in 17,600—about scary. Everyday activities, such twenty-five times greater. as riding in a car, are more Passenger flights began in familiar. Therefore, they feel 1914. Since then, fewer than safer. People also feel safer twenty thousand people have when they control a situation. died in U.S. airline crashes. For instance, drivers feel safe in Twice as many people die cars, knowing that they control every year in U.S. car crashes. them. Airplane passengers don’t have this feeling of control. Pan Am Flight 103 created this crater in Lockerbie, Scotland, when it crashed after being bombed in 1988. While an air accident can cause more deaths at one time, automobile accidents still cause more deaths overall. Modern airplanes are built to be safe. They have emergency exits, seatbelts, and other safety devices. Airplane pilots receive top-level training. A government agency called the Federal Aviation Administration oversees airplane travel in the United States. It makes sure that air travel is as safe as possible. Since passenger flights began, air travel has gotten safer and safer. Still, flying in airplanes will never be 100 percent safe. The skies over the United States and other countries are crowded with aircraft. Every day in the United States, about eighty-seven thousand airplanes take to the air. With so many planes in flight, there’s always a risk that one will crash. The First Crash Victim Orville and Wilbur Wright built the first successful airplane. They made their first flight at Kitty Hawk, North Carolina, in 1903. Five years later, in 1908, Thomas Selfridge was flying with Orville Wright at Fort Myer, Virginia. Their plane crashed (below). Selfridge was killed, and Wright was badly injured. Selfridge was the first person ever killed in an airplane crash. looked up. My hair was flowing into the sky and just above me were clouds. Airplanes line up to take off at one of the busiest airports in the world, Chicago’s O’Hare International Airport. The Hindenburg catches fire as it lands in New Jersey. ON APRIL 15, 2002, AIR CHINA FLIGHT 129 WAS ABOUT TO LAND AT AN AIRPORT IN S OUTH KOREA . B UT THE PILOT AND COPILOT STRUGGLED WITH THE WEATHER . S TRONG WINDS MADE IT HARD FOR THEM TO CONTROL THE PLANE . H EAVY FOG AND RAIN MADE IT HARD TO SEE . T HEN THE PILOTS MADE A MISTAKE . C ONFUSED BY THE BAD WEATHER , THEY DIDN ’ T TURN THE PLANE TOWARD THE RUNWAY AS PLANNED . T HEY MISTAKENLY FLEW THE PLANE STRAIGHT INTO A 1,000- FOOT (304 M ) HILL . T HE PLANE CRASHED INTO THE HILLSIDE . O F THE 166 PEOPLE ON BOARD , 128 DIED. MANY OF THE SURVIVORS WERE BADLY HURT. The Air China accident involved the two main causes of air disasters: mistakes by pilots and bad weather. Terrorism—violent acts such as bombing—is a less common cause of air disasters. cockpit of a Boeing 747. Pilots must train for years before they can fly large passenger planes. Flying a plane takes experience and judgment. If problems arise in flight, pilots must make decisions quickly. Pilots who fly for big airlines are well trained. They have college degrees and many years of experience flying planes. Some are former U.S. Air Force pilots. They have flown warplanes on dangerous missions. Yet pilots aren’t perfect. They can make mistakes. In fact, pilot error is the number one cause of air disasters. The wreckage of Air China Flight 129 burns on a hillside. In addition to pilots, many other people help airplanes fly. Air traffic controllers keep track of hundreds of airplanes. They use radar to monitor planes in the sky. They also use computers and other tracking systems. They make sure that airplanes in flight stay a safe distance from one another. They tell pilots when it is safe to travel down runways, take off, and land. But air traffic controllers are human too. They can also make mistakes, such as misreading a radar screen. Other workers repair and maintain airplanes, pump fuel into planes, and load baggage. These workers, too, can make mistakes. For instance, in 1979 airport workers entered the wrong instructions into the computer on board Air New Zealand Flight 901. The plane took passengers on a sightseeing flight over Antarctica. The computer error made the plane fly in the wrong direction. The pilots didn’t realize they were going the wrong way because they were flying through heavy clouds, which blocked their view. By the time they figured out something was wrong, it was too late. The plane crashed into a mountain, killing all 257 people on board.
} Two air traffic controllers use radar screens to direct air and runway traffic. WEATHER OR NOT Bad weather is the second most common cause of air disasters. Usually, pilots can avoid bad weather. Modern airplanes often fly more than 35,000 feet (10,668 m) above the ground. At this height, they fly above most bad weather. Airplanes also have radar screens. These devices show pilots the location of rain and snow. Pilots can change a plane’s course to avoid bad weather they see on radar screens. They can fly higher to get above the weather or steer around a storm. But sometimes it’s impossible to avoid bad weather. For instance, during takeoffs and landings, planes fly low in the sky, where there might be storms. Sometimes, bad weather hits unexpectedly. Then pilots and air traffic controllers must make quick decisions: Should planes on the ground take off? Should planes in the air land, or should they circle in the sky until the bad weather clears? Should they fly to another airport where the weather is better? Sometimes, pilots and controllers don’t make the right decisions. In the air transportation business, bad decisions can be deadly. SNOW AND ICE, BURSTS AND BUMPS During winter, snow and ice might cover airport runways. Icy runways are slippery and dangerous, just like icy roads. And just like car drivers, pilots might have trouble steering and stopping airplanes on ice- and snowcovered runways. Airport workers use plows to keep runways clear. But sometimes snow piles up faster than plows can clear it. In 2005 a snowstorm hit Chicago. Southwest Airlines Flight 1248 skidded on a snowy runway during landing. The airplane slid onto a busy road near the airport. It crashed into several cars. The crash killed one car passenger, a six-year-old boy. Several other car passengers were seriously injured. Jets cruise more than 35,000 feet (10,668 km) above the ground. During cold, rainy weather, pilots and airport workers worry about ice forming on airplane wings. Even a thin coating of ice can make the wing surface rough. Without smooth, ice-free wings, a plane cannot climb, or rise, properly or stay in the air. At airports, airplanes often sit outside during rainstorms and snowstorms. During these times, ice can build up on airplanes’ wings. So workers at airports spray planes with deicing liquid, a chemical that melts ice. Wings can also ice up during flight. For instance, a plane might fly into freezing rain. The rain freezes instantly when it hits the plane’s wings, coating them with ice. Modern airplanes have heaters that melt ice on wings. A crew uses a chemical But even with heaters and deicers, ice can still cause air deicing liquid to remove disasters. In Washington, D.C., in 1982, Air Florida Flight 90 snow and ice from a plane did not get a complete deicing before takeoff. The ice following a blizzard in disrupted the flow of air that normally lifts a plane off the Denver, Colorado. ground and keeps it in the sky. As a result, Flight 90 dropped out of the sky and crashed. Seventy-nine people on board died. In 1994 American Eagle Flight 4184 crashed after flying into freezing rain. That crash killed sixty-eight people. Microbursts are another weather danger for airplanes. These small, sudden, downward blasts of wind frequently occur during rainstorms. During takeoffs and landings, microbursts can hit planes without warning and knock them to the ground. Air turbulence—or bumpy air—can slap an airplane that is flying high. Turbulence often occurs without warning—even when the sky ahead is clear. Turbulence rarely causes crashes, but it can shake an airplane and damage it. Passengers who are not wearing seatbelts might bounce to the ceiling. Workers remove the tail section of Air Florida Flight 90 from the Potomac River in 1982. MECHANICAL FAILURE Airplanes are built to stay in the air. For instance, most passenger planes have more than one engine. If one engine fails, the plane can still keep flying with another engine. In addition, mechanics and other workers spend many hours inspecting, maintaining, and fixing airplanes to keep them in top condition. Believe It or Not How could a 1-pound (0.5-kilogram) bird destroy a 90,000pound (40,824 kg) airplane? By flying into the airplane’s engines, that’s how. In 1988 an Ethiopian Airlines flight took off into the sky. But right after takeoff, the plane’s powerful engines sucked in some pigeons. The birds damaged the engines. The plane crashed. Thirty-one people died. But airplanes are still machines. They have engines, landing gear, and other mechanical equipment. Even with the best maintenance, mechanical equipment can wear out or break down. In July 1996, 230 people died when Trans World Airlines (TWA) Flight 800 crashed into the Atlantic Ocean. Investigators determined that the cause was a short circuit in the plane’s electrical wiring system. The short circuit caused the plane’s fuel tank to explode.
} The remains of TWA Flight 800 sit in a U.S. Navy hangar. Investigators put the pieces back together to determine the cause of the crash—a short circuit in the electrical wiring. Salt Lake, United 718 . . .
An army helicopter hovers over the site of the 1956 plane crash in the Grand Canyon. Canyon. In any event, at 10:31 the planes crashed into each other at 21,000 feet (6,400 m). The pilots in the TWA plane probably never saw United 718, because it approached from behind. United 718’s left wing hit the top of the TWA plane. Its propellers sliced open TWA 2 like a knife. Captain Robert Shirley, pilot of United 718, radioed a message to the control tower at the airport in Salt Lake City, Utah. He said his plane was going down. Both planes crashed into the Grand Canyon. All 128 people died. .
EARTHQUAKES AND HURRICANES HAPPEN ONLY IN CERTAIN PARTS OF THE WORLD . OTHER DISASTERS , SUCH AS BLIZZARDS AND TORNADOES , USUALLY HAPPEN AT CERTAIN TIMES OF THE YEAR . A IR DISASTERS ARE DIFFERENT. AIR DISASTERS CAN HAPPEN AT ANY TIME OF THE YEAR. AND AIRPLANES CAN CRASH ANYWHERE . However, wealthy countries, such as the United States, have more money to spend on airline safety. Other countries, such as poor countries in Asia and Africa, have less money for airline safety. As a result, air disasters are more likely to happen in poor countries than in wealthy ones. SAFE IN THE SKY Every airplane flight includes three main stages: takeoff, cruising, and landing. Cruising is the safest part of the flight. Airplanes usually cruise at 35,000 feet (10,668 m) in the air. Suppose an airplane encounters a problem, such as mechanical failure, during cruising. The pilots would certainly be worried. But they would also have time to solve the problem. An airplane can glide, or descend, gradually, even if its engines have A Boeing 747 stopped running. Gliding high in the sky, the pilots could can carry 57,000 find a solution to their problem. They wouldn’t have to gallons (215,745 worry about hitting the ground right away. liters) of fuel. That’s enough fuel to fill a big swimming pool. 900,000 pounds (408,000 kg) at the beginning of a flight. The fuel can account for more than half that weight. To get the heavy plane into the air, the plane’s engines must work at full power. But sometimes, an engine or another mechanical part breaks under the stress. In addition, bad weather occurs close to the ground. Planes sometimes fly into storms right after takeoff. Suppose an airplane encounters a problem soon after takeoff. The plane is near the ground. It can’t glide through the air for many minutes as it can during cruising. The pilots have just seconds to solve the problem. If they don’t solve it quickly, the plane might crash to the ground. Other air disasters happen at the end of a trip—during the landing phase. Landings have several ingredients for disaster. One ingredient is low altitude (height above the ground). As with takeoffs, the closer an airplane is to the ground, the less Southwest Airlines Flight time a pilot has to react to a problem, be it a microburst, 1445 skidded off the end of thunderstorm, or mechanical failure. a runway at the Burbank, Another ingredient is speed. Airplanes must slow California, airport in 2000. down to land safely. By the time a Boeing 747 lands, it will have slowed to about 100 miles (161 km) per hour. But airplanes need speed to stay aloft. The slower an airplane’s speed, the harder it is for pilots to control. famous air disasters Air disasters happen all around the world. This map shows just a few places where major air disasters have occurred. Up! [Or] we’ll crash into a mountain! looking up in wonder hillside. when the airplane started to nosedive. Then there was a big crashing sound like a thunderbolt and then a flash, after which a mushroom cloud of smoke rose from behind the mountain.” Only 4 people survived the crash, and 520 people died. MANY PEOPLE WERE KILLED ? MEMBERS OR FRIENDS ON THAT PLANE ? Measuring air disasters does involve counting injuries and deaths. But there’s more to the process than that. After an air disaster, investigators try to find out why the aircraft crashed. They study the crash to learn how to prevent similar crashes in the future. ACCIDENT DETECTIVES The National Transportation Safety Board (NTSB) is a U.S. government agency in Washington, D.C. This office studies airplane and other transportation accidents. Within hours of an air disaster, a “go team” from the NTSB hurries to the scene. The team includes experts with many different jobs. Some experts interview eyewitnesses to the crash. Some examine weather conditions that might have caused the crash. Others sort through the wreckage of the aircraft. They look for signs of mechanical problems that could have caused the disaster. Still others look at radar images of the plane recorded just before the crash. BLACK BOXES Some of the first things investigators look for after a crash are the airplane’s black boxes. These two recording devices are installed on all passenger planes. Missing Boxes After some air disasters, black boxes are never found. Some sink into deep water. Some break apart during crashes, despite their protective steel coverings. The blackened remains of the data recorder from an airplane crash are shown below a new data recorder. One box is the airplane’s cockpit voice recorder (CVR). The other is the flight data recorder (FDR). The CVR records all sounds heard inside the cockpit. It records conversations between the pilot and the copilot, announcements the pilots make to passengers, and other sounds from the airplane. The FDR records other data about the airplane. This information includes the plane’s speed, altitude, changes in direction, and other movements. Investigators use the data from the black boxes to piece together In 1972 Eastern Airlines Flight information about a crash. 401 was preparing to land at Often in an air disaster, all the night at Miami International plane’s equipment is smashed to bits. Airport. At the last minute, But the FDR and CVR are enclosed in the pilot noticed a burned-out strong steel boxes. The boxes protect lightbulb on the instrument the recordings from damage in a crash. panel. It should have been The boxes can withstand hot flames glowing to show that the from burning fuel. They can fall landing gear was in the proper thousands of feet without breaking. The position for landing. But the boxes are waterproof in case a plane bulb was dead. The pilot and crashes into a lake or ocean. Despite the copilot replaced the bulb. nickname, black boxes are actually While doing so, they let the painted bright red or orange. The bright plane descend too quickly. The color makes the boxes stand out among plane crashed in the the other wreckage. It makes them Everglades region of Florida. easier to find. The disaster killed 100 of 176 people on board. Investigators listened to recordings from the CVR to figure out what had caused the crash. On the recordings, they heard the pilot and copilot talking about the lightbulb.
} NTSB experts reconstructed this Boeing 747 that crashed into the Atlantic Ocean after taking off from New York in 1996.
might have caused the crash. By piecing all the clues together, investigators usually can find the disaster’s cause. Some investigations are long and difficult. For instance, it took the NTSB four years to figure out why TWA Flight 800 crashed into the Atlantic in 1996. Finally, investigators determined that a short circuit had caused the crash. Once the NTSB determines the cause of a crash, it uses this information to make air travel safer. For instance, if the NTSB finds that a faulty fuel tank caused a crash, it might require airplane manufacturers to improve fuel tanks. THE HUMAN TRAGEDY The cause of a crash is not the only mystery officials try to solve after an air disaster. Airplane crashes are violent. People who die in crashes often suffer severe burns and massive injuries. Their bodies may be impossible to recognize. It usually takes a team of experts to identify victims after an airplane crash. A special group called the Disaster Mortuary Operational Response Team (DMORT) works with the NTSB to identify air disaster victims. DMORT members include specially trained doctors and other medical workers. They may spend days or even weeks identifying victims at a crash scene. Some air disaster victims can be identified quickly. For example, a body might be found intact. It might have a purse or a wallet nearby. DMORT workers can compare a driver’s license photograph or other picture ID to the dead body. But many bodies are badly burned or torn up after air disasters. Then identification takes much longer. DMORT workers must do a lot of detective work. They often compare victims’ teeth to records kept by dentists. They also use fingerprints, scars, and other markings to identify victims. Boeing 747 that crashed in Buenos Aires in 1999.
it must have been for them. Firefighters try to put out the smoke and flames of the crashed Concorde in Paris. fireball, like a mini-atomic bomb went up, and it was really just a sickening sight,” said Sid Hare. All 109 people on the plane and 4 people on the ground died. What had caused the disaster? A sharp piece of metal had broken off another plane and fallen onto the runway. One of the Concorde’s tires hit the metal and blew out. Pieces of the tire punctured the plane’s fuel tanks. The fuel caught on fire. After the crash, designers gave the Concorde stronger tires and fuel tanks. But people were afraid to fly on the plane. Within three years, Air France and British Airways decided to stop flying the Concorde. Concorde . . . you have flames! You have flames behind you! The Concorde trailed flames as it attempted to take off in Paris. DISASTERS USUALLY INVOLVE MANY DEATHS . WHEN AN AIRPLANE HITS THE GROUND , IT BREAKS INTO THOUSANDS OF PIECES . F LYING PIECES OF METAL CAN CUT, TRAP, AND SMASH PASSENGERS . A IRPLANES ALSO CARRY LARGE AMOUNTS OF FUEL . W HEN A PLANE BREAKS APART, THAT FUEL SPILLS OUT. H EAT AND SPARKS FROM THE CRASH CAN SET THE FUEL ON FIRE . E VEN PEOPLE WHO LIVE THROUGH THE CRASH MAY BURN TO DEATH IN THE FIRE . M ANY PARTS OF AN AIRPLANE , SUCH AS THE SEATS , WALLS , AND STORAGE BINS , ARE MADE OF PLASTIC . W HEN PLASTIC BURNS , IT GIVES OFF POISONOUS SMOKE . PASSENGERS TRAPPED IN A BURNING PLANE MAY DIE FROM BREATHING THE SMOKE . But many people survive air disasters. Some survive because of good luck. Others survive because of airplane safety features, quick thinking on the part of flight crews, and the quick response of emergency medical teams. FIRST RESPONDERS Airplane flight crews are trained to handle emergencies. Before takeoff, flight crews give passengers a quick lesson on emergency procedures. They show passengers the airplane’s emergency exits, or extra doors. They tell passengers the importance of wearing seatbelts. In the first seconds after a crash, flight crews are the first rescue squads. They help passengers get out of the plane quickly. Firefighters rescue an injured passenger after a plane crash in Costa Rica in 2000. Big passenger airplanes have eight emergency exits. Emergency exits allow many people to leave an airplane at once. Passengers don’t all have to file through a single door in front. To help passengers reach the ground, emergency exits have slides. The slides Worldwide, more than three are inflatable—they blow up like balloons. million people fly on Passengers slide down these cushiony passenger airplanes every day. chutes to reach the ground safely. A SUCCESS STORY The story of Air France Flight 358 proves that air disasters don’t have to be tragedies. The plane crashed upon landing at Toronto Pearson International Airport in Toronto, Canada. It began to burn. The plane carried 309 passengers. However, nobody died during the crash. Only forty-three people suffered injuries. The passengers and crew all survived because they got out of the crashed airplane quickly. The crew worked fast after the crash. “People were tripping over each other, climbing over the seats to get to the exit,” said Dominique Pajot, a passenger on the flight. “They [the flight crew] were very quick to get up and open the [emergency] doors and help people and calm them.” The flight crew’s good work saved many lives. Passengers of Air France Flight 358 run from the burning plane after it crashed upon landing in Toronto, Canada. TO THE RESCUE After an airplane crash, every second counts. Fire trucks and rescue workers must arrive very quickly to help victims. Sometimes, if a pilot knows the plane is in trouble during flight, the pilot will notify the nearest airport. The airport will send out a rescue team even before the disaster happens. Large airports have their own fire trucks and rescue teams. Airports sometimes ask for help from fire and medical workers in nearby cities. Getting help fast can be difficult, however. Not all crashes occur near airports or cities. Some disasters happen over the ocean or another body of water. Some disasters happen in wilderness areas with very few people. When a plane crashes in a remote area, rescue workers might have to use boats, helicopters, or other special vehicles to reach the victims. In 2006 an Armenian airliner crashed into the Black Sea, near Russia. Rescue workers traveled to the crash site in boats. But by the time they arrived, they found only dead bodies floating in the water. JAL Flight 123 crashed high in the mountains. It took rescuers twelve hours to reach the crash scene. By then many people who survived the crash had frozen to death. EMOTIONAL SCARS Long after an air disaster, the emotional scars remain. Those who lose friends and family members in a crash feel great sadness and shock. Those who survive a crash are often haunted by memories of the terrible event. Survivors who are injured must cope with health problems. Several organizations, such as the American Red Cross, specialize in helping disaster victims cope with their problems. These groups hire social workers and counselors to offer support to victims and their families. Rescue workers often see horrible injuries and deaths at crash sites. Even they sometimes need counseling after air disasters. This group of crash survivors waited for seventy days in the Andes Mountains of South America to be rescued. Two of the survivors walked down from the mountain to get help for the rest of the survivors. Victims’ families cope with their losses in different Juliane Koepcke, a seventeen-year-old from ways. Some start memorial Peru, sat next to her mother in an airplane in funds named for their loved 1971. The plane flew through a thunderstorm ones who died. Family, over the rain forest in Peru. Juliane looked friends, and others can out the window. She saw that the plane’s contribute money to the wing was on fire. The last thing she funds. The money is used for remembered was spinning and falling through good causes, such as helping the air. Three hours later, she awoke in the students pay for college. rain forest. She had fallen 2 miles (3.2 km) These programs give people a to the ground. All the other ninety-one way to remember and honor people on board the plane had died. How had those who died. Creating Juliane survived? Winds in the thunderstorm something positive from a may have blown upward, slowing and tragedy helps survivors feel cushioning her fall to the ground. Juliane better. wandered through the rain forest for eleven After the September 11 days before being rescued. air disasters, people around the world built monuments to honor the victims. New York City will have the biggest monument. It will cost more than $500 million to build. It will stand at the World Trade Center site. The monument, called Reflecting Absence, will include reflecting pools, a waterfall, a museum, and a wall with the names of September 11 victims. New York has also started work on a new skyscraper, Freedom Tower, to replace the World Trade Center buildings. Reflecting Absence is scheduled to open in 2009, and Freedom Tower is set to open in 2011.
} This simple but personal memorial stands in the Pennsylvania field where United Flight 93 crashed on September 11, 2001.
crashed into it on September 11, 2001.
passengers, teams of terrorists were traveling on board each plane. After takeoff, the terrorists hijacked (took control of) the airplanes. The terrorists crashed United Flight 175 and American Flight 11 into the 110-story World Trade Center in New York City. That famous skyscraper had twin towers rising 1,360 feet (416 m) in the air. More than fifty thousand people worked in the offices inside. House. But passengers decided to fight the hijackers. “Are you guys ready?” passenger Todd Beamer asked the other passengers as they prepared to fight. “Let’s roll!” As the passengers struggled against the hijackers, the plane went down. It crashed in a field in Pennsylvania. Everyone on board died. —New York City firefighter Mike Smith, describing the World Trade Center attacks The September 11 attacks killed about three thousand people. The attacks shocked and saddened people worldwide. After the attacks, the United States made many changes to air transportation. It created the Transportation Security Administration. This government agency works to keep flights safe from terrorists and other dangers. HOWEVER, THEY ALSO TEACH US LESSONS THAT CAN MAKE FLYING SAFER . F OR INSTANCE , AFTER THE 1956 G RAND CANYON AIR DISASTER, THE U.S. GOVERNMENT STARTED A NEW AIR SAFETY OFFICE . T HAT OFFICE BECAME THE MODERN - DAY F EDERAL AVIATION ADMINISTRATION. Modern air travel is very safe, and it is likely to get even safer. That’s because airplane designers are always looking for ways to improve airplanes and safety equipment. WIRELESS BLACK BOXES In the future, airplanes might use wireless technology instead of flight data recorders and cockpit voice recorders. With “wireless black boxes,” airplanes will not store data on board. Instead, cockpit voice recordings and other data will travel in real time (second by second) to stations on the ground. Ground stations will record and save the information. It will always be available—fast—in case of a disaster. No one will have to search for a black box at a crash site. Wireless technology will also help pilots cope when disasters threaten. Imagine if JAL Flight 123 had had wireless technology before its tail fin broke off. A wireless black box could have warned airline mechanics on the ground that the tail was getting dangerously weak. The mechanics could have told the pilots to land before the tail broke off.
} Officials use a crash test dummy to test airline seat safety at the Federal Aviation Administration training and research facility in Oklahoma City, Oklahoma. FIREPROOF FUEL Many passengers survive an airplane crash at first, but then they die in the fire caused by spilled fuel. In the future, airplanes may use fuel that doesn’t catch fire easily after a crash. U.S. Navy and U.S. Air Force planes already use this kind of fuel. This fuel is more expensive than regular fuel. If passenger airlines use it, they will have to charge passengers more for tickets. After an airplane crash, a After the four airplanes plane usually catches on fire. crashed on September 11, Thick smoke fills the plane. nobody knew if terrorists Crash survivors often cannot might be on board other see exit doors through the airplanes. For safety, the U.S. smoke. Adding to the danger, government grounded (kept people breathe in deadly out of the air) all nonmilitary smoke from burning plastic airplanes in the United States. inside the plane. In the About forty-five hundred future, airplanes may be built airplanes were already in the with safer plastics. These new air at the time of the plastics will not burn or will disasters. All those planes had burn very slowly, giving to land at the nearest airport. people more time to escape after a crash. In addition, the plastics will not release poisonous gases when burned. Airplanes in the future may also be equipped with a smoke hood for each passenger. A smoke hood is a clear plastic bag with an air filter. The hood fits over a passenger’s head. It protects the face and hair from fire and also filters out toxic gases. After a crash, smoke hoods would help passengers escape a burning plane. dangerous smoke when they crash. In the future, airplane passengers might have parachutes to use in escaping an airplane crash. When air force and navy planes fall out of the sky, the pilots have one last chance to survive. They can leave the plane using a device called an ejection seat. An ejection seat sends a pilot rocketing out of a doomed plane. The pilot then floats to the ground using a parachute. Why can’t airline passengers also escape by parachute? In the future, they may do so. But parachuting for passengers won’t be easy. Using a parachute safely takes a great deal of training. Most passengers do not have that training. So engineers must figure out how to make parachuting safe for untrained people. FEAR-FREE FLYING As terrible as air disasters are, remember that they are very rare. Don’t let worries about air disasters spoil the fun of flying. Always remember that flying is the safest kind of travel. of the plane quickly. • Fly in large airplanes instead of small ones when possible. happen during takeoffs and landings. If your trip is nonstop, you’ll have to take off and land only once. Timeline 1903 Wilbur and Orville Wright make the first successful airplane flight at Kitty Hawk, North Carolina (below). 1908 Thomas Selfridge, flying with Orville Wright, is the first person to die in an airplane crash. 1937 The Hindenburg crashes in Lakehurst, New Jersey. 1956 Two planes collide over the Grand Canyon, killing all 128 people on board. 1974 A cargo door on a Turkish airplane is not closed properly before takeoff. The error causes the plane to crash, killing 346 people. 1977 Two planes collide on a runway in the Canary Islands, killing 583 people. 1979 An engine falls from an American Airlines flight in Chicago (left). The plane crashes, killing 273 people. Air New Zealand Flight 901 crashes into Mount Erebus in Antarctica, killing 257 people. 1983 A South Korean airliner flies off course into the Soviet Union. Soviet fighter jets shoot down the airplane, killing all 269 people aboard. 1985 Japan Airlines Flight 123 crashes in the mountains in Japan, killing 520 people. 1988 A U.S. Navy ship accidentally shoots down an Iranian airplane. More than 300 people die in the crash. Libyan terrorists plant a bomb on Pan American Flight 103. The plane explodes over Lockerbie, Scotland, killing 270 people. 1994 American Eagle Flight 4184 flies into freezing rain in Indiana. The plane crashes, killing all 68 people on board. 1996 A pilot on a Kazakhstani airplane misunderstands air traffic control instructions. The plane collides with a Saudi Arabian airplane over India (left). The crash kills 351 people. 1998 Swissair Flight 111 crashes near Nova Scotia, Canada, killing 229 people. to make transportation systems safer. Orville Wright, who made the first successful airplane flight in 1903.
behind-the-scenes activities at an airport. and spacecraft and teaches visitors about the technology of flight. National Air and Space Museum, Washington, D.C. http://www.nasm.edu/museum This museum at the Smithsonian Institution displays historic airplanes and exhibits on the history of aviation. _canyon.htm (May 7, 2006). 27 Parker Moon, “Eyewitness Report: Southwest Airlines 1455,” AirDisaster.com, n.d., http:// airdisaster.com/eyewitness/wn1455.shtml (May 1, 2006). 31 David M. Lisk, comp., “SkyNet—Special Report,” Airline Disasters 1920–1997, 1997, http:// dnausers.d-n-a.net/dnetGOJG/120885.htm (April 6, 2006). 31 Ed Magnuson, “Last Minutes of JAL 123,” Time.com, June 21, 2005, http://www.time.com/ time/magazine/article/0,9171,1074738-7.00.html (November 19, 2006). 31 Ibid. 31 Ibid. 42 Beth Duff-Brown, Associated Press, “Canada Plane Crash Has Textbook Evacuation,” August 3, 2005, 1. 43 Duff-Brown, “Canada Plane Crash.” 49 Jim McKinnon, “The Phone Line from Flight 93 Was Still Open When a GTE Operator Heard Todd Beamer Say: ‘Are you guys ready? Let’s roll,’” Pittsburgh Post-Gazette, September 16, 2001, http://www.post-gazette.com/headlines/ 20010916phonecallnat3p3.asp (October 22, 2006). 49 Guardian, “Special Report: September 11, 2001,” Guardian Unlimited, September 12, 2001, http:// www.guardian.co.uk/september11/story/ 0,,600839,00.html (April 15, 2006). American Red Cross. “Aviation Disasters: Unique Disasters Demand Unique Responses.” 2002. http://www.redcross.org/news/ds/trans/ 030115Airteam.html (April 15, 2006). Aviation Internet Group. Aviation History On-Line Museum. April 8, 2006. http://www.aviation -history.com/ (April 29, 2006). Bilstein, Roger E. Flight in America: From the Wrights to the Astronauts. Baltimore: Johns Hopkins University Press, 1984. Blatner, David. The Flying Book: Everything You’ve Ever Wondered about Flying on Airplanes. New York: Walker & Co., 2003. Boetius, Henning. The Phoenix: A Novel about the Hindenburg. New York: N. A. Talese, 2001. Davis, Lee. Man Made Disasters. New York: Facts on File, 2002. Department of Transportation. January 10, 2006. http://www.dot.gov/ (April 3, 2006). Federal Aviation Administration. March 25, 2006. http://www.faa.gov/ (April 25, 2006). Job, Macarthur, and Matthew Tesch. Air Disaster. Vol. 2. Fyshwick, AU: Australian Aviation, 1996. MacPherson, Malcolm, ed. On a Wing and a Prayer: Interviews with Airline Disaster Survivors. New York: HarperCollins, 2002. Mooney, Michael M. The Hindenburg. New York: Dodd, Mead & Company, 1972. National Transportation Safety Board. 2006. http://www.ntsb.gov/ (April 3, 2006). Negroni, Christine. Deadly Departure. New York: Cliff Street Books, 2000. Rinard, Judith E. The Story of Flight: The Smithsonian National Air and Space Museum. Buffalo: Firefly Books, 2002. Spignesi, Stephen J. The 100 Greatest Disasters of All Time. New York: Kensington Publishing Corp., 2002. Winter, Frank H., and F. Robert van der Linden. 100 Years of Flight: A Chronicle of Aerospace History, 1903–2003. Reston, VA: American Institute of Aeronautics and Astronautics, 2003. 2001. Milwaukee: World Almanac, 2004.
the Wright brothers to Commander Eileen Collins, the first female to command a space shuttle. vivors of a plane crash on her estate. flight at Kitty Hawk in 1903.
forest, and a mysterious hit man! in 1937? This film provides the answers. crew trying to save the airplane. plane crash in the Canadian wilderness. He survives for fifty-four days by using his hatchet, common sense, and luck. Ranson, Candice. Fire in the Sky. Minneapolis: Carolrhoda Books, 1997. In this work of historical fiction, Stenny is very excited about the arrival of the Hindenburg. Then he witnesses the ship’s fiery crash landing. Santella, Andrew. September 11, 2001. Danbury, CT: Children’s Press, 2002. 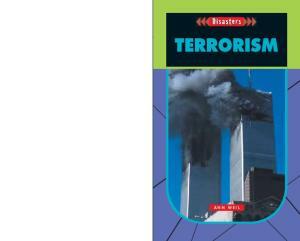 Part of the Cornerstones of Freedom series, this book examines the September 11 attacks and the responses of various politicians. Virtual Skies http://virtualskies.arc.nasa.gov/ Produced by the National Aeronautics and Space Administration, this site explores aviation technology and air traffic control. investigations of, 32, 34, 36; map of, 28 CVR (cockpit voice recorder), 34. About the Authors Michael Woods is a science and medical journalist in Washington, D.C. He has won many national writing awards. Mary B. Woods is a school librarian. Their past books include the eight-volume Ancient Technology series. The Woodses have four children. When not writing, reading, or enjoying their grandchildren, they travel to gather material for future books. Report "Air Disasters (Disasters Up Close)"